The house is filled with the wonderful smells of Christmas baking; shortbreads, cakes, chutney and these delicious biscuits – all just great for gifts that everyone appreciates. I have a theory (I think this is about number 248!) – if you can’t think what to buy someone as a gift, give them consumables – something they can eat or drink – you really cant go wrong and they will definitely be grateful i’s not another pair of socks! These biscuits were inspired by our recent adventures in the Moluccas – the Spice Islands of Indonesia, where nutmeg, cloves and mace come from. We were on a ‘Food as Medicine’ sailing trip around these faraway islands that are steeped in stories of fantastic deeds, terrible tragedy, fortunes made and lost, villains and heroes and lots and lots about FOOD. There was so much to discover and absorb. 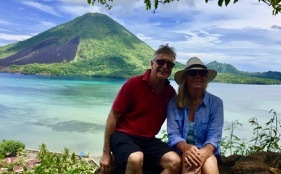 So here we were, me and me mate, sitting under a nutmeg tree on the island of Banda Besar overlooking the Banda lagoon and Gunung Api; the active volcano that last blew in 1988 and still bears the lava flow scars. These warm waters teem with marine life that made for fabulous snorkelling as we floated from one thermal updraft to another – just magic. We had just climbed up a steep hill into an old nutmeg plantation and I was astounded at the very tall trees that overshadowed them – the kenari (Canarium indicum) known as the Asian almond; fantastic 30m trees with magnificent flying buttresses and always grown on these islands alongside nutmeg to protect them from the sun, wind and storms. I had never heard of them before and wondered why they hadn’t become a tradable commodity like the nutmeg and mace? But then, Europeans didn’t need these because they had their own nuts – almonds, walnuts, hazelnuts and pistachios – they just wanted the spices. 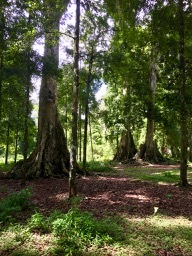 The massive trunks of kenari trees with the spindly nutmeg scattered underneath. Put butter and sugar into food processor and process until light and creamy. Add the flour, salt and nutmeg and process until mixture is all incorporated and forms one ball. Don’t over process!! 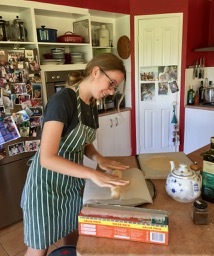 Have a nice big piece of non-stick paper ready on your bench top to turn the biscuit dough onto then gently form into a flattened disc with neat edges – it makes it easier to roll out later, then pop into the fridge for about twenty minutes. This is, essentially, a shortbread dough and will fall apart unless you chill it first. Take out of the fridge. Place another piece of non-stick baking paper on top and roll out and gently roll out to biscuit thickness. Have some baking trays prepared lined with non-stick paper. Get a willing grandchild to help you. 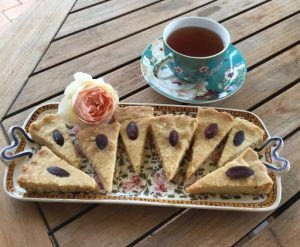 Cut into any desired shape and place an almond on top. Bake for about 20-25 minutes until biscuits are firm. Remove from oven and let cool on the tray. If you cant be bothered to do all that rolling or cutting, simply divide up the mixture and press it neatly into round, fluted baking tins or quiche dishes. Bake as for above, but will take slightly longer – maybe 45 minutes. When it is cooked, remove from oven and gently score the top into portions. When cool, these will easily break up into serving pieces. 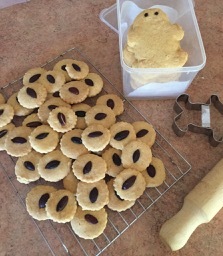 NOTE: As these biscuits were cooling on the bench-top they suddenly became a whole lot more festive. I was reading a book about Asian rainforest trees when I came upon this information; the kenari tree is related to the trees that myrrh and frankincense come from – the Burseraceae family. 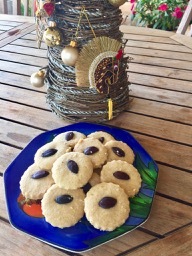 Now for my money, from now on I’m going to be telling anyone who wants to listen that the Three Kings were bringing myrrh, frankincense and, not gold, but kenari nuts!